The first gate I built was at my mom’s house. I wanted to keep Smart Jr (who was about 1-year-old) from getting out of the back yard. I asked around to a couple of friends, but nobody wanted to come build me a gate. Go figure. So I decided to do it myself. This was 11 years ago and several people told me I couldn’t build a gate and I needed to hire someone to do it. How hard could it be? I thought. I bought a 6’x8′ fence panel (kinda like this, but it wasn’t dog eared) from Lowe’s and cut it down to the size I needed. Oh, I also had to buy a circular saw because I didn’t own any tools at the time. Crazy huh? This is the gate 11 years later. I put in that fence panel on the left too. The one that looks backwards. But let me just tell you that the other two fence panels inline with that one (which had been there for years) are facing that way too so I was just being consistent. I just wanted to extend the “yard” a bit. You can buy a gate kit at Lowe’s or Home Depot, but it’s not necessary, nor likely to be exactly what you want. Although this one looks pretty darn perfect, because I like decorative (longer/skinnier) hinges and a latch instead of a handle. What you really don’t need is one of these gate frame kits, they’re ugly, expensive and not necessary. But these corner braces at 4 for $30 might totally be worth it. Oh and you can definitely build a gate yourself! This part is critical, so take your time figuring this out. 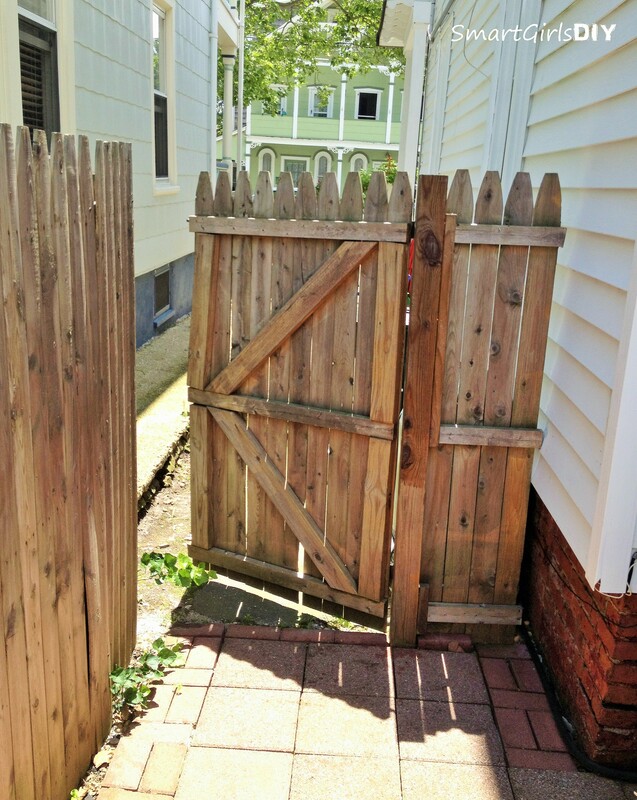 You always need a fence post (a 4″ x 4″), or other sturdy surface like the side of a house, on either side of the gate. One is to attach the hinges and one to attach the latch. In the gate above I was unable to dig a post hole next to the house and did not want to attach anything to the siding. I also didn’t want the gate to take up the full span from the house to the fence, so I put in a post a few feet from the house and used that for the hinges. I attached the latch to the fence post at the end of the fence panel (but you can’t see it in this picture). The yard at my mom’s is tiny and I didn’t want to waste any space on an in-swinging gate, so I made the gate open out to the alley way. You can buy them in a kit or separately, just make sure the hinges can support the weight of your soon to be gate. If your hinge opens out (like the gate at my mom’s house), then the hinges go on the outside. If the gate opens in (like both gates at my house), then the hinges go on the inside. The latch doesn’t have anything to do with the hinges. One of my gates is short, less than 4 ft tall and if I put the latch on the inside my kids would be able to reach up an unlatch it. So I put it on the outside, even though the hinges are on the inside. Sneaky, huh? My arbor gate is much taller, so the latch is on the inside because it’s high enough they can’t reach. I built these gates years ago, but my little kids are now 5 and 6-years-old and I’m happy to report that they still can’t open either gate. Yay peace of mind! To find the width of the gate, measure the distance between the posts and subtract about 3/4″ to allow room for movement. The height will usually be the same as the fence it attaches to, but there are exceptions, like the gate I made for my garden arbor, which wasn’t really attached to a fence. Also make sure the gate has adequate clearance at the bottom, so it’s not dragging along the ground when it opens. This is especially important if your gate is on uneven ground. Yup, I haven’t drawn anything yet, just a bunch of standing around picturing a swinging gate in my head, but now it’s time to get down to business! Your gate will need a frame to attach the hinges, fence boards (pickets) and cross braces. So draw a rectangle. Decide what size wood you want to use. I tend to go with 2x4s for my frames, but you may be able to get away with something smaller. Let me point out that the fence I built at my mom’s already had horizontal pieces because I started with a fence panel. So take that into consideration in your design plan. If you’re building from scratch (like the two gates at my house) you’ll need to make a complete rectangle. If your gate is super tall or wide (let’s say a span of more than 4 ft) then you might want to use more than one rectangle. See the gate at my mom’s has a double frame, while my short gate has a single frame. 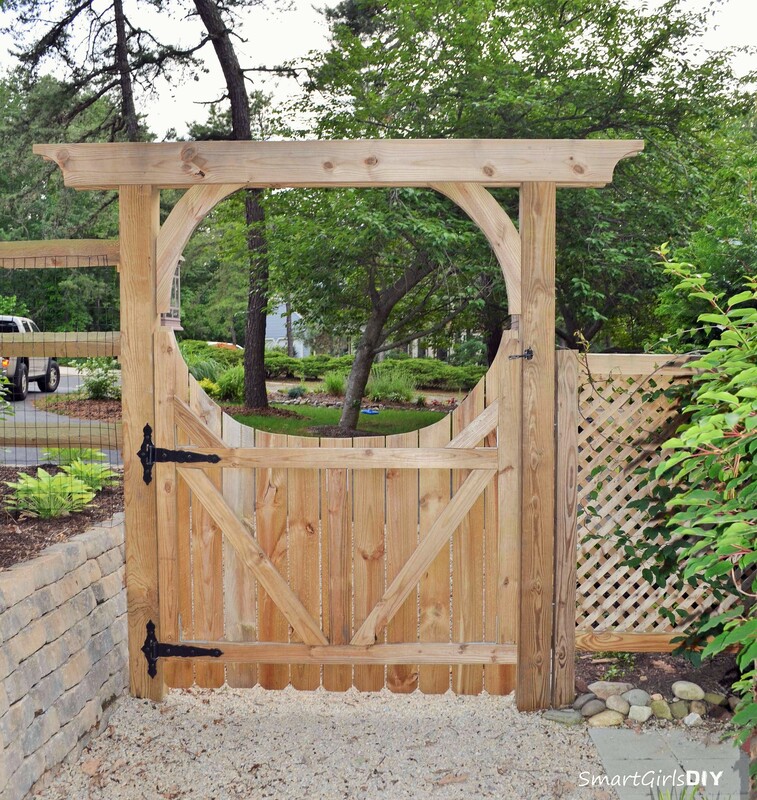 The arbor gate is kind of in a class by itself, because it is very wide and has a curved top. It has a double frame (although the middle piece is hard to see in this picture because it blends in with the fence picket) and multiple support braces. Here is the back of the arbor gate. (The post on how to build the arbor is HERE) Speaking of support braces (cross braces, angle braces) — you need ’em! Smaller gates can get away with one (like my short gate), but the bigger the gate, the more support it needs so it doesn’t sag or warp. You can cut the braces with a single angle at each end (mom’s gate and arbor gate) or with a double angle (my short gate). 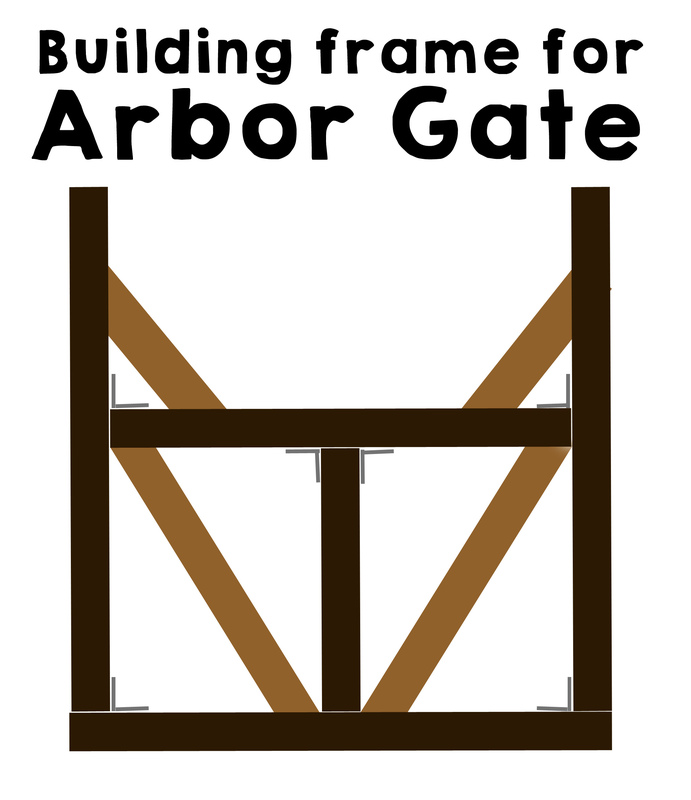 Here is the design for the arbor gate. There’s no point in giving you dimensions, because the chances your gate is the same as mine is slim. But notice that the sides of my rectangle extend beyond the top of the frame. There is a center support and two sets of cross braces. I used 6 corner braces for the right angles. Be sure to use galvanized ones like this so they don’t rust. I just screwed in the single angle braces directly to the frame. On my short gate I used a Kreg Jig to screw together the frame. If you are building from scratch, you also need to figure out what pickets you are going to use. I used 5/8-in x 5-1/2-in x 72-in Pine Dog-Ear Pressure Treated Wood Fence Pickets, which are $1.18 each at Lowe’s. To figure out how many you need take the width of your frame, divide by width of the picket, and that’s how many pickets you need. But grab an extra because things can get crazy when you start laying it out. I used the same pickets for both gates at my house, but notice on the small gate I put the dogeared edge on top and cut the bottom straight. I cut each board with my compound miter saw, because I now have a whole garage full of tools, which is one reason the gates at my house look so much nicer. But on the arbor gate I put the dog eared side at the bottom because I was going to be cutting the top of each board differently anyway. Using your drawing, cut and attach the piece to make the rectangular frame first. You can use corner braces (arbor gate) but you don’t have to (other two gates). Next cut the angles in the cross braces and attach. Finally attach the pickets. Now this was a little trickier for the arbor gate because of the curved detail. I made the curve by laying the pickets out on my driveway, decided on the spacing I liked, then I free hand drew the arch to mimic the arch on the garden arbor. I picked the side of the arch I thought looked best and went over those pencil lines with a Sharpie. I numbered each picket with a pencil, matched the opposing (mirror image) pickets then cut two pickets at a time along the curved line with a jig saw. When it was time to screw them to the frame, I went by the numbers and laid them out along the frame, double checking my spacing (I did it by eye, but you could totally make yourself a spacer), then put two screws though the picket where it overlaps the frame. It might be good to grab a helper for this part. It’s hard to hold a gate level, mid air, and mark holes for hinges at the same time. The hinges will attach to the horizontal part of the frame. So hold up the gate and get a good look at it first. Mark where the horizontal part of the frame hits the post (the one the hinges will attach to). Then attach the hinges to the POST making sure they are perfectly horizontal and that there is enough clearance for the actual hinge part. Hold the gate in place once more (centered between, but not touching either post) and mark where the hinge holes fall on the frame. Take the gate back down and pre-drill the holes. Then have someone hold the gate in place while you attach the hinges to it. FYI – I had to buy the hinges for the arbor gate from a fence store I found on Craigslist. They don’t make anything remotely big/strong enough to hold the weight of this gate at HD or L’s. Pretty self explanatory, but the stick part goes on the gate and the latching part goes on the post. Put the two piece together, place the unit against the post/gate and mark where the holes fall. Then attach. Yay! You’ve build and hung a gate!! And now I can go to bed. Sheesh that was a long one!! Thank you for posting this! We built a field fence a few years ago for the dogs and put a metal gate on each opening (from Tractor Supply). They are really functional and look…well…like they belong on a farm. But I am trying to convince my husband to rip out one section that is the only piece viewable from the road, and replace it with your arbor gate/lattice fence. We used round posts for our fence and they aren’t tall enough to do the arbor, so I’m sort of stuck having to take them out and replace them with tall squares to make this all happen. As they are set in concrete already the hubby isn’t too happy about it, but I’m about to just do it myself. Can’t wait to see how this all ends up! do you have any pictures to share of the fence you built? I am so grateful to have found your site. The fences you built is exactly the kind I am looking for. I have just recently acquired some tools and I was going to hire a contractor but after seeing you article and how you did the job yourself 11 years ago, I am just impressed and you have inspired me to try making the fence myself. Hi Jeanne. I’m so glad you found me too! Which fence are you talking about? The split rail fence at my house or the solid picket fence I built at my mom’s house? I’d be happy to write a post on either one, just let me know which you want to hear about. Thanks! Hi Smart Girl! Yes, totally cool site. I too am inspired to do this myself now, as others have said. I am new to this and have a question: How did you attach the cross braces to the frame on the arbor gate? You mentioned using a Kreg Jig for the small gate, but on the arbor gate…I cannot see how they are attached. Wow I am in love with that gate! Gives a really nice oriental feel to the entrance, and your space is beautiful! Looks really tranquil! 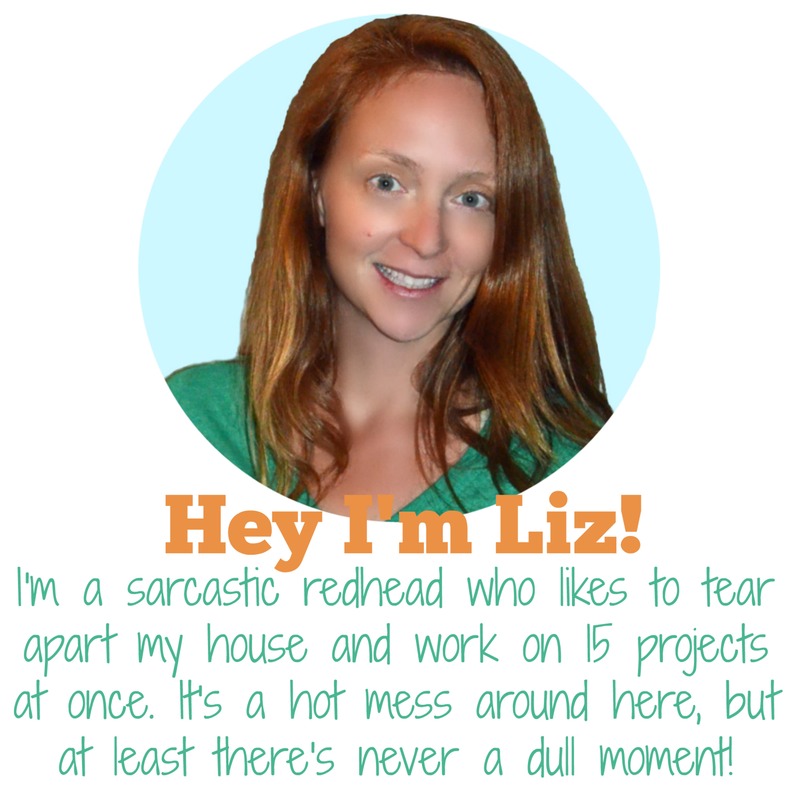 Thanks for sharing Liz! Keep up the great work! I’ve helped fix a gate before, and the hardest part for me is getting the hinges to balance in order to swing without getting stuck. Also, the elements outside will cause the wood to shrink and expand, and eventually the gate won’t fit anymore. How do you prevent this?